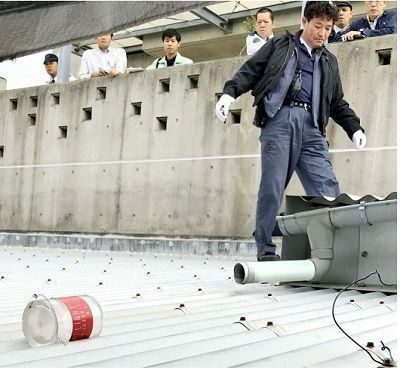 The Ginowan Police department are continuing to investigate the cause of the dropped object. According to a witness, at around 10:15 a.m. a CH-53 was seen taking off from MCAS Futenma in the direction of Nodake. Nursery School Principal Takeshi Kamiya said that there were around 60 children in the school around the time of the drop. The children were playing outside, having just finished practicing for the Christmas play when the canister landed on the metal roof of the one-year-old’s class. Had the canister landed a few feet from where it did, it would have been right in the playground. 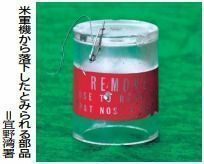 According to Ginowan Police, the canister is around 9.5 cm long, a diameter of around 7.5 cm, 8 mm thick, weighing around 213 grams. The message “Remove before flight” is written on the front in English. According to the U.S. military’s website, the canister is very likely a cover for an instrument that detects abnormalities in the motion of the propeller. The Ginowan City Assembly reached out to the Special Committee on Bases for help with the response.